NOVEMBER SPECIAL OFFER! 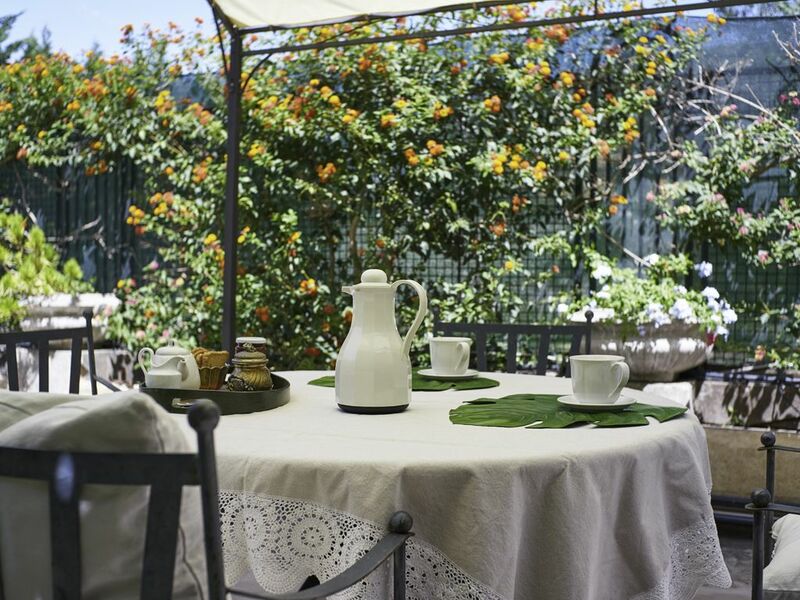 "La Nana" is a delightful villa in the green in the heart of the impressive Gulf of Gaeta. Colored and original in furnishings, it is equipped with all comforts (air conditioning, autonomous heating, indoor parking ...) and a large and well-kept garden with a gazebo where you can sunbathe or dine and dine. By type and size (living room, kitchenette, 2 bedrooms and 1 bathroom) it is suitable for 4 people but can accommodate up to 6 guests thanks to the comfortable and practical sofa bed in the living room. The house, located in front of the beach, is ideal for those who want to indulge in 'forgetting' the car. Restaurants, pizzerias, bars, post office, supermarket, Roman Porticciolo, Cicero's Tomb ... everything is within walking distance. Easy and direct links to the islands of Ponza and Ventotene, daily guaranteed by ferries and hydrofoils and the railways with Rome (160 km) and Naples (90 km), making it a strategic destination for your holiday at any time year. bathroom with window, shower, hairdryer. The area is rich in archaeological sites, having been among the favorite destinations of the Ancient Romans. In the city of Formia it is possible to visit Il Cisternone (one of the largest underground hydraulic structures of the Roman period that has come down to us), the Tomb of Cicero, the Archaeological Museum, the Roman Port of Gianola. In the nearby Sperlonga, instead, there are the remains of the Villa of the Roman Emperor Tiberius. It is also easy to get to the nearby Suio (20 km), famous for its thermal baths rich in springs with temperatures from 0 ° to 60 ° whose waters are classified as the first in Italy. Also from Formia you can take the ferry or hydrofoil to Ponza and Ventotene, two beautiful islands of the Tyrrhenian Sea. For those who want to play sea sports, the area in front of the house is considered one of the best Italian windsurfing areas, for the combination of calm sea and strong wind. A few hundred meters from the house, there is also a playground Suitable for those traveling with children. Valeria is a great host, very friendly and responsive. The house is indeed right on the beach and is very well equipped. The restaurant next to the house is excellent and very cheap. Clear benefit from being away from touristy towns. There is however road noise behind the property. The house is clean and comfortable. The sea is just downstairs, several restaurants and cafe in the area, grocery in 100 meters. In the house yard there is a lot of space for children to play. Valeria is very nice and helpful. It was a great pleasure for us to stay at her house. Tolle Unterkunft, bestens ausgestattet, schöner Garten und super Lage direkt am Meer. Wir haben 5 Tage in der schönen Unterkunft von Valeria und Simone ( beide sehr sympathisch und hilfsbereit) verbracht und uns dort sehr wohl gefühlt. Waren mit öffentlichen Verkehrsmitteln unterwegs mit unserer kleinen Tochter, ging alles super. Absolut weiter zu empfehlen! Vielen Dank für alles Valeria ! Die Wohnung ist grosszügig geschnitten und gelungen eingerichtet, die Ausstattung entspricht völlig der Beschreibung. Der grosse Garten steht einem zur Verfügung, die Zitronen frisch vom Baum sind herrlich. Ein kleiner Supermarkt und das Postamt sind in unmittelbarer Nähe zu Fuss erreichbar. Auch eine Auswahl von Restaurants sind zu Fuss erreichbar. Wir waren in der Vorsaison dort, das Strandleben hatte noch nicht begonnen. Valeria ist eine unkomplizierte Gastgeberin. Bei Anliegen wurde uns rasch geholfen. Het huis is voorzien van alle gemakken en ligt direct aan het strand. Een mooie grote tuin met citroenbomen en een terras, waar we 's-avonds heerlijk limoncello genuttigd hebben. The villa is located on the seafront of Vindicio where you can spend a sea vacation in total relaxation by forgetting the car. Restaurants, pizzerias, bars, mini-market, supermarket, children's playground ... everything is within walking distance. From Formia, in less than one hour, thanks to hydrofoils and daily ferries, it is possible to reach the Ponziane Islands, places of extraordinary charm. While in just 30 minutes drive you will reach Suio, a small village on the slopes of the Aurunci Mountains renowned for its beneficial and relaxing thermal waters. Not to forget that Formia is half way between Naples (90 km) and Rome (160 km) with which it is connected by a direct rail network with very early departing and arriving trains. In less than an hour (car / train / bus) you can visit the Royal Palace of Caserta (built in 1752), the largest existing royal residence, belonging to the Borboni or the Abbey of Montecassino, one of the most famous in the world .